Hope you all have a great weekend ahead! We are shooting something fun on Saturday, and my plan is to have it post Monday. We’ll see. The pool might be calling my name, and you know I won’t be able to resist, even though I should be working on my homework (the blog) 🙂 Sometimes I really do feel like I’m back in school! Such a pretty scarf! I have a couple different colors and prints because they are so versatile and perfect to wear now! Totally in love with this maxi scarf!! Awesome!! Beautiful scarf! Great for cool mornings! I always love a good blanket scarf and the springy colors in this one are perfect! Looking forward to (maybe!) Monday’s post! Doesn’t it feel like homework? I say enjoy the pool if you can — it’s 30 degrees here today and I am in need of some sun and warm weather! Enjoy some for me!! Have a great weekend, Shauna! Love the soft colors!! Your scarf is gorgeous!! lol-go o the pool–here, I really need this scarf allll day because it’s so cold! A lightweight blanket scarf like this is perfect for transiting to spring! Love it, lady! I love the checked scarf, your shoes and your bag.You look great. Obsessed with this bag!! And I love your scarf! Love the shades of blue – this scarf is so amazing… and not to mention that bag is incredible! Such a cute look! Love that scarf. The fact that you are talking about being at the pool this weekend makes me SO jealous!! That scarf is the perfect spring layering piece! I’m swooning over that bag! Have the best weekend! 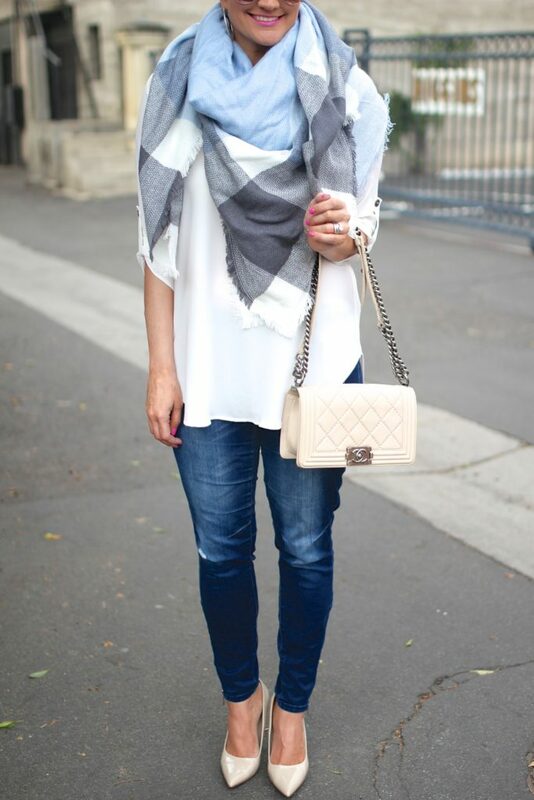 Love the checkered scarf, looks lovely paired with blue jeans and a white shirt! 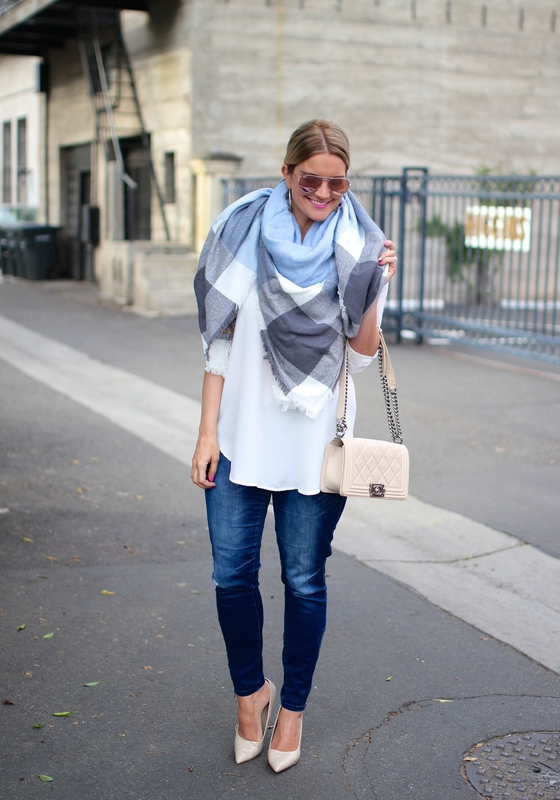 Love that big, cozy scarf and the cool tones! That bag is also GORGEOUS! I usually think o blanket scarves for the fall, but the colors in this one are perfect for spring. Love! SO cute and I love the scarf, it totally takes the whole look to another level! Girl, your tan is always perfect! 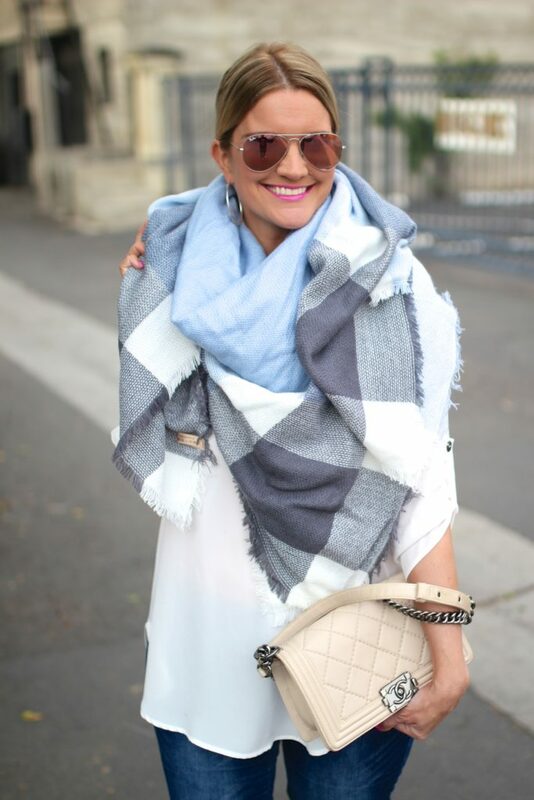 I love everything about your blanket scarf! They’re perfect for chilly mornings! Beautiful look! Love the scarf! Love these cozy blanket scarves! Can it be Spring already, tho?! I’m loving this scarf, and it’s perfect for spring. I’m so jealous of the weather you are having. Have a great weekend. This blanket scarf is So pretty. Love the color palette. What a gorgeous scarf! I love bold scarves, they’re so chic and fun! I love the beautiful pastel colors! Your blanket scarf is perfect for transitioning to spring! Hi Shauna! I adore your style- this look is every feminine and elegant. And your ivory Chanel Boy is a dream!!! I love that outfit! Blanket scarves are the best. Have a great weekend! That is a cute blanket scarf! I like the blue and grey together 🙂 I like layering with scarves in spring too, easy to take off and on as the weather changes through the day. Hope you are having a great weekend, if you spent time in the pool or did blog stuff! Such a cute scarf an bag! You look so gorgeous Shauna, the scarf is super cute! I love the large check and colors of this blanket scarf! A really great way to stay warm while making the spring transition. Thanks so much for linking up with Fabulous Friday!